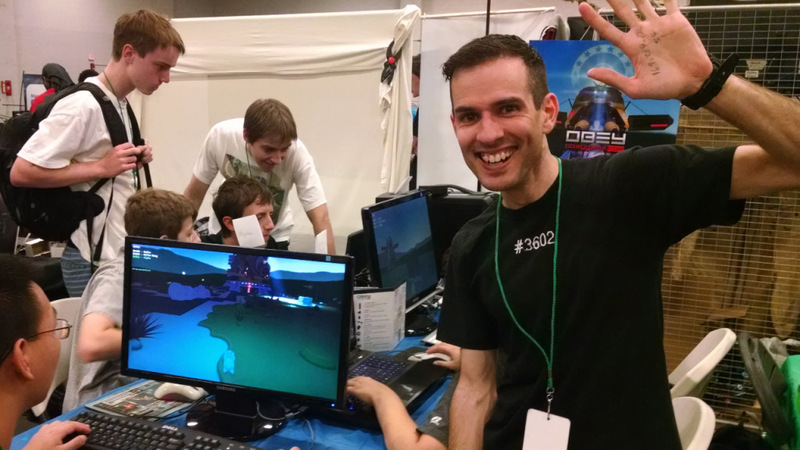 On last Saturday I showed OBEY off at Boston Festival of Indie Games. I brought 5 computers and set up a LAN so people can play the game. The response was overwhelming. And it gave me hope that I can pull off a kickstarter to finish this project. A bunch of people told me it was their favorite game in the whole show, including some press guys. All 5 computers were filled practically the entire time with people playing and trying out the game. About 50 people signed up for our kickstarter emailing list and a bunch of people left and came back later to play again after seeing the rest of the show. Some were absolutely glued to the game. For the most part, people played the game using the ‘king of the hill’ strategy (basically shooting everything that moves)… except for 1 or 2 groups of players that kept playing for over 1 hour: after a while they started coercing each other. This is pretty much what I expected to happen, so it also gives me hope that the design is taking shape, too. Fast forward to Monday where I showed OBEY at Boston Indies Demo Night at MIT to other local Boston devs and indies (after some minor bug fixes that were exposed during BostonFIG). Again, I was glad to see people drawn to the game, and I had a lot of players considering there were maybe only 40 people in attendance, and some of them seemed to be having fun for long periods of time. But my best takeaway was some great and very specific feedback from people who know games and know design. A very special thank you to Clever Endeavour Games for taking the above picture and for featuring me in their article!